Through the stock market crash of 1929 The Citizens Bank of Ray City remained in business , and the local ”boosters” remained optimistic. (see Bank of Ray City, GA through Optimism and Depression) The firm’s letterhead from 1928 shows George W. Varn was president; James H. “Jim” Swindle, Vice President; John D. Luke, Cashier; and J. W. Johnson, assistant cashier. As we understand it the Citizens Bank of Ray City is one of the strongest financial institutions in the county and its business is growing steadily as will be shown by the last financial statement as called for by the superintendent of state banks. It has total resources of over $150,000, and deposits of over $100,000 and shows that it has no notes and bills rediscounted. Berrien county is justly proud of its banking institutions and conservative business men do not hesitate to place the Citizens Bank of Ray City along with the head of list. 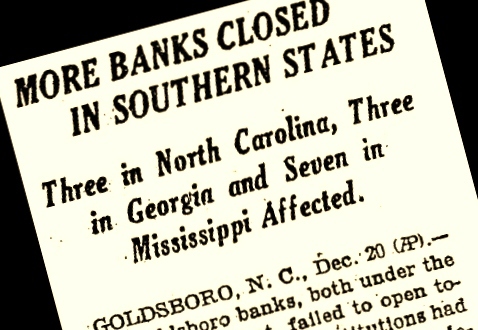 In fact, in July of 1930, the Atlanta Constitution had reported that the banks of Berrien County, including the Ray City bank were financially sound. But by the end of December, the Citizens Bank of Ray City had failed. The closing of The Citizens Bank of Ray City was among those announced in December of 1930. ATLANTA, Ga., Dec. 20 (AP) – A. B. Mobley, State Superintendent of Banks, announced today his department had been asked to take over the affairs of the Union Banking Company of Douglas, operating branches at Barxton and Nichols, the Toombs County Bank at Lyons and the Citizens Bank of Ray City. Cause of the closings was not stated. Mr. R.E. Dean who is in charge of the affairs of the closed Ray City bank is making satisfactory progress with his work. Optimism prevails in regard to the opening of the bank, for there can be no better location for a banking institution than Ray City, situated as it is in the heart of one of the finest farming sections in South Georgia, and the land tilled by experienced and reliable farmers who are good for their contracts. If Offer Is Accepted Depositors Will Receive 50 Per Cent Net. According to an announcement of a hearing to be held before Judge W.R. Smith at the court house in this city Saturday, Feb. 21, an application will be made by the State Superintendent of Banks, A.B. Mobley, to sell the assets of the Citizens Bank of Ray City, which closed a short while before Christmas. It is understood that the depositors have recommended that the offer be accepted. The Herald was unable to learn whether or not the bank would be reopened for business. As we go to press encouraging news reaches us, that while permanent arrangements has not yet been perfected for the opening of the bank there, yet tentative arrangements have and the bank has been doing business since Tuesday. This good news will increase the optimism, now prevailing in this section over the picking-up of business generally. The Ray City Banking Company has reopened for business under an agreement to pay the depositors 50 per cent cash for the amount of their deposits, and has been making these payments since last Thursday. It is understood that many of the depositors are leaving their money in the bank, which although a private institution is said to be doing a good business, and receiving large deposits. The above arrangement was made possible through the efforts of Messrs. George W. Varn, A.D. Lee and Y.F. Carter, who put up the money with which to pay off the depositors. Mr. John D. Luke, cashier before the bank was closed, is again acting in this capacity. The institution is known as the Citizens Banking Company, and serves one of the best communities in this section. The general prediction is that the institution will continue to prosper. Article transcriptions provided in part by Skeeter Parker. In 1905, local investors including some with Ray’s Mill connections formed the Bank of Milltown. The bank was chartered March 14, 1905 and the bank opened for business March 21, 1906. The Bank of Ray’s Mill was organized around 1908 with George W. Varn as president and Lewis M. Marshall as cashier. Its directors were J.H.P. Johnson, J.H.Swindle, C.O. Terry, Y.F. Carter, Harmon Gaskins, and Frank Fountain. Wallace Johnson, son of J.H.P Johnson, began working for the bank when he was fourteen years old. Lewis M. Marshall served as the bank’s cashier until he was succeeded in the early 1920’s by John D. Luke who held the position until the bank failed during the great depression – probably around 1931. 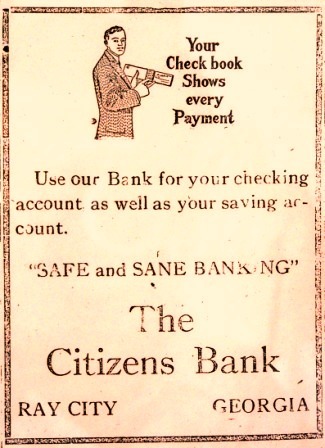 In 1909 the bank’s name was changed to Citizens Bank of Ray City. The Annual report of the Treasurer and State Bank Examiner of the State of Georgia for the year ending 1910, still lists the bank as the Bank of Ray’s Mill, with a capital of $15,000 dollars. That sum would have been about $6 million in 2007 dollars.